Stiffening of the big toe joint after bunion surgery can best be prevented by performing daily stretching and range-of-motion exercises at this joint. Range-of-motion exercises are important to achieve the best results after surgery. This very important part of the recovery process depends on your willingness and attention. If, during your recovery, you are having difficulty performing your exercises, please consult your physician. Rest and elevation. No exercises are necessary during this period. Begin mild, assisted range-of-motion exercises. Grasp the big toe near the base of the toe, close to the big toe joint. Do not mistake the big toe joint for the interphalangeal joint. The interphalangeal joint is the joint in the middle of the big toe, closest to the toenail. 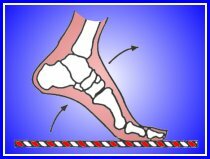 Gently flex the toe upward until resistance is met and mild discomfort is experienced. Then hold for approximately ten seconds. Perform this three times; then flex the toe downward in the same maneuver for three sets of ten seconds each. This series of exercises should be performed three times a day during the second week. During this period, the same manually assisted range-of-motion exercises should be increased to approximately six times per day with a gradual increase in vigor and force applied to the toe each day as tolerated. Begin gravity-assisted and weight-bearing exercise programs. This is performed by lifting the heel up, keeping the big toe on the ground, and using body weight to force flexion at the toe. Stand on the toes for approximately ten seconds at a time as tolerated. Beginning to walk uphill to force flexion of the toe, and walking up steps can be excellent exercises to increase the flexibility in the big toe joint. In addition, you may also implement distraction and manipulation stretching program described below. Grasp the forefoot with one hand just behind the big toe joint with the thumb on top of the foot. With the other hand, grasp the big toe at the base, close to the big toe joint. First distract the big toe as the arrows illustrate in Figure A. Then, while stabilizing the forefoot with the thumb of the first hand (Figure B), push the big toe upward with the second hand without bending the toe (keep the toe straight). Hold for approximately ten (10) seconds and perform these three times. Perform the same maneuver by pushing the big toe downward, keeping the toe straight as illustrated in Figure C. Hold for approximately ten seconds and perform three times. This exercise regimen should be done approximately six times a day in addition to the range-of-motion exercises. It is important to keep in mind that post-operative swelling can persist for six months or longer after bunion surgery, and the ability to wear tight shoes or fashionable women's shoes is very difficult when swelling and stiffness are present.